« Flying with Royal Air! XC tracks in Orsa Grönklitt - beautiful conditions! …I’ll ski there too I once had a t-shirt that read. Still have it, in fact. I got it on a ski trip in Canada in the 90’s. Back then I was all about alpine skiing, now I’m more into XC-skiing. For many reasons – it’s cheaper, it’s much better in terms of excercise and it’s quite social. 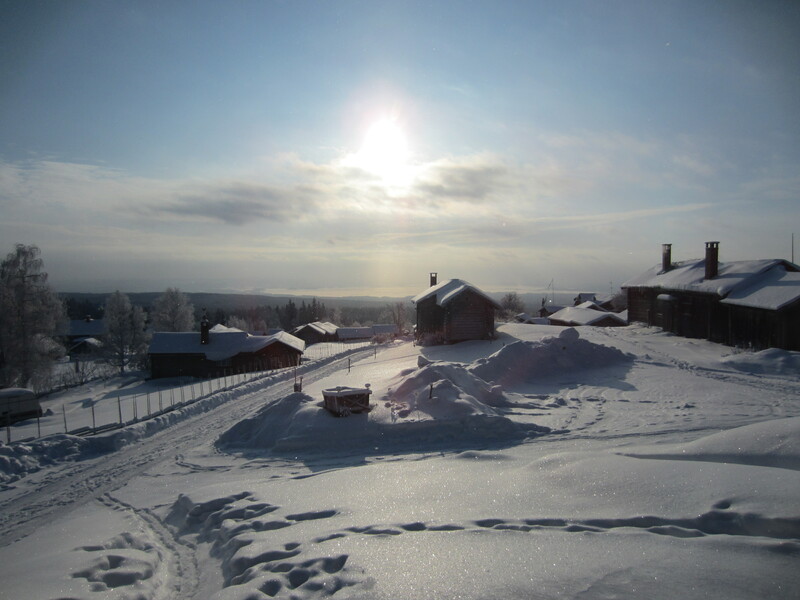 This past weekend we went to Orsa in Dalarna with my “sports club” at work, just like we have the last two winters. This year however, we’d managed to time the coldest weekend of the winter – sporting some 20 degrees Celcius below zero on Saturday, and warming up (!) to 15 below on Sunday. Cold, colder, coldest. I was exhausted too. And cold. I’d pretty much brought all my winter gear, and yet figured it’d be a good idea to invest in a fleece balaclava. One of my better decisions this winter. As long as you kept moving it wasn’t so ad, but once you stopped…brrrr! Freezing! We managed to ski 12,5 km before lunch, and after treating some abraisons on my heals (I never learn) we set out for another 11,5 km in the afternoon. It nearly killed me. A, who had come along for the weekend, forgets from time to time that I’m: older than him, a woman, overweight and have a body riddled with arthritis. Thus, he tends to expect too much from me. Darkness was falling too, and it got so much colder – instantly – when the sun set. In the evening we went out to dinner at Fryksås Hotell – a lovely three course set meal. Yum! We were all so worth it! 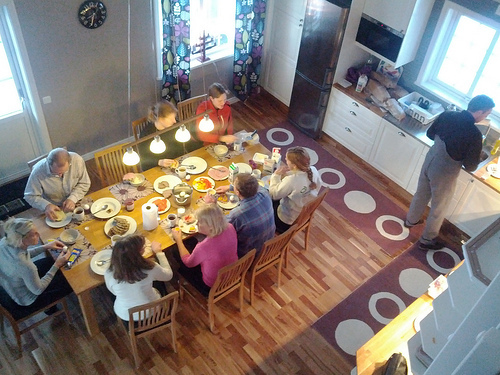 Breakfast time in the cabin. We stayed in a brand new cabin, all ten of us. It was so nice, with five bedrooms, two bathrooms and a sauna (of course). The next day, Sunday, it was a balmy 15 degrees below zero, and we got ourselves ready for another day on the trails. I’d intended to ski 10 km, but my heals stopped me after a mere 5 km 😦 I felt week and didn’t perform as well as I’d hoped, but I simply couldn’t go on. Instead I skied through the forest over to Smidgården in Fryksås – the best lunch place, possibly ever. The wiews are stunning, the cakes wicked and the lunches both yummy and filling. Views toward Orsasjön, Lake Orsa, from Smidgården in Fryksås. Thank you Gina! I’m actually Swedish, but have been an expat myself, living in the US, Canada, NZ and London during different periods 🙂 I’ll check your blog out too! Thank you for sharing. Great photos. I’ve just stumbled upon your blog and really enjoy your writing. I’m a fellow American abroad, as well; which instantly made your stories jump off the page. 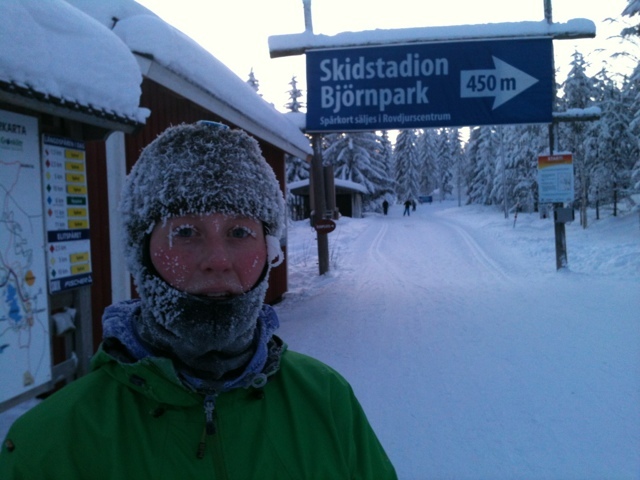 We skiied in -30 C weather, here, last year, too. I was beyond startled when I looked at my 6 year old who had icicles for eyelashes! Nice stories. I look forward to tuning in again soon. Megalagom – it didn’t feel to cold as long as you kept moving 🙂 And the scenery and excercise was well worth it too! Wow that makes me shiver! As long as its not as cold as it looks. That last photo is so beautiful! Glad you have something you can enjoy! Hi Emma! The snow and views are stunning! Simply beautiful! Maybe I should visit Sweden in the winter! 🙂 Looks like a fun trip! Kate: Hehe, I know!!! If I’d just seen the pic would’ve assumed I’d be freezing, but as long as I kept moving it really wasn’t that bad! OMG Icicles on your FACE!